The Initiative of Black People in Germany condemns the death threats against activist Mouctar Bahr | ISD-Bund e.V. Berlin, September 25th 2013: The activist and laureate of the Carl- von-Ossietzky-Medal for human rights has received death threats against him and his children. The Initiative in Memory Oury Jalloh has published a press release with an interview of Mouctar Bah and the events surrounding these threats. Since 2005 the Initiative in Memory of Oury Jalloh has been fighting for the judicial recognition of the racially motivated death of Oury Jalloh. On January 7, 2005, police in the Saxony-Anhalt city of Dessau took Jalloh into custody after he had allegedly harassed two women while under the influence of drugs and alcohol. At the police station, he was apparently beaten, suffering a broken nose and a ruptured eardrum. He was then tied down to a bed in a cell and shortly thereafter was found burned to death under circumstances that remain unclear up to this day. 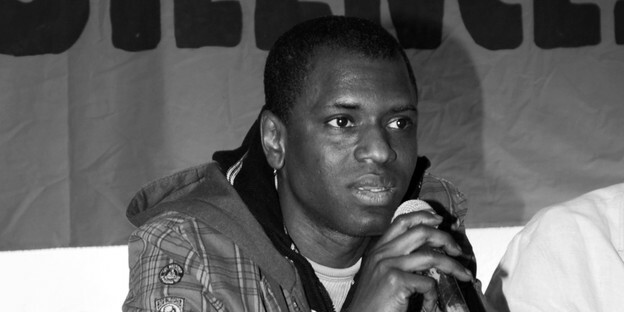 The Initiative has since then relentlessly been fighting for the recognition surrounding the death of Oury Jalloh by the German judicial system. The events of that night still remain unsolved. The death threats coincide with a long series of events of harassment against activists of the Initiative and signify another peak. During last year’s memorial demonstration peaceful activists were violently attacked by the police with some sustaining substantial injuries. Preceding the current death threats against Mouctar Bah his Telecafe in Dessau was vandalized. (Despite the continued intimidation and attempts at silencing the Initiative, Mouctar Bah and others continue to strive for the truth surrounding Oury Jalloh’s death.